It's not surprising that many writers are also talented artists, and many artists also write. In some cases - David Jones is an obvious example - it's impossible to say which medium predominates. But I was still surprised to stumble across the accomplished etchings featured in this post, created by Johann Wilhelm von Goethe in 1768, at the age of 18. Although he is remembered today as Germany's greatest writer, early in life Goethe was inclined to become a painter; his lifelong interest in art is evidenced in his book On Colour, and of course the hero of The Sorrows of Young Werther is an aspiring artist. 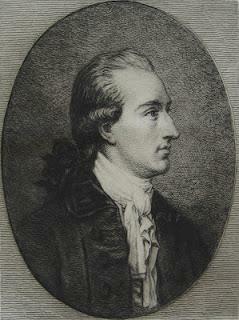 While studying law in Leipzig from 1765-1768, Goethe took drawing lessons from Adam Friedrich Oeser, director of the Leipzig Academy, who became a key influence on him. 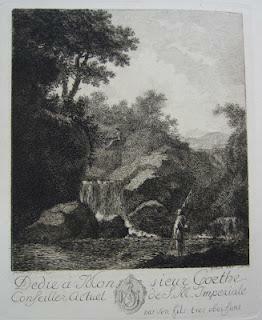 It was Oeser who encouraged Goethe to take up etching, and taught him the technique. My two Goethe etchings were printed in 1893 from copper plates that had remained in the possession of a Leipzig family and were subsequently donated to the Leipzig city library. 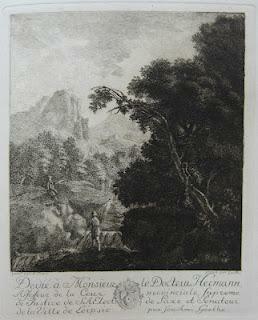 Both are interpretative etchings after landscapes by Alexander Thiele (1686-1752), and each has an etched dedication below the image, one to Goethe's father, and the other to his law teacher Dr. Christian Gottfried Hermann. The effect is rather like a pair of bookplates, though the etchings were not intended for use as exlibris.